Display the Manufacturer of workstations in the list view using the column chooser. Search workstations by typing in the Mac Address in advanced search. Sort workstations in the list view by Probe Name. Technicians with quotation marks in their names couldn't add service and incident requests. Preventive maintenance tasks are not saved for the given dates if the instance's time zone is set to the application server's time zone. When a template of a request (service or incident request) is modified using a business rule, tasks in the new template are duplicated. Inside the live chat window, the option to view recent requests added by any requester does not work correctly. The All My Sites filter in the change calendar view does not work correctly when the user's site count is high. When a user's approval action does not affect a change request, the user will be notified under Pending Approvals. Under Reports >> New Custom Report, report type descriptions have been revamped. In the workstation list view, Table search results are not retained when you open the details page of any workstation and press Back. When a user approves a request for which the user has no view permission, the request's approval status is not changed. The issue occurs only if the After request gets approval action, start the timer and set request status is enabled in the self-service portal settings. If a workstation is rescanned after changing its site, all site-based software licenses are deallocated from the workstation. A workstation with empty or "-" value for Service Tag is renamed (by adding _old to the current name) and duplicated if new service tag is fetched during the rescan. Configure a clear sequence of statuses for any incoming request so that the assigned technician is guided to the next possible transition(s) easily. The next possible transition for any request is displayed in the request details page. Associate a life cycle to any number of templates. However, a template can be associated with only one life cycle. The life cycle contains nodes (request statuses) and transitions. The transitions are paths that connect two statuses. The transition configurations are divided among three phases - Before, During, and After. Each transition phase can be configured with rules to check for criteria and trigger corresponding actions, such as update fields, execute custom actions, trigger webhooks, add tasks, or send notifications. You can also mandate request fields during a status execution than when the request is being logged. Rules can be configured to abort the resolution of invalid requests as well. The transitions can be restricted by login permissions. That is, only authorized technicians will be able to work on specific transitions. Use a common transition to connect multiple statuses to one status without duplicating the transition configurations. Configure request life cycles under Setup >> Automation >> Request Life Cycles. Configure backup users to handle requests and approvals of users during their planned leave. Using this feature, you can reassign service and incident requests and configure backup approvers for service, incident, and change requests and purchase orders. Under Admin >> Automation >> Delegation, enable the feature and configure the global settings. Users who mark leave after you enable the feature will be listed under Home >> Delegation. Here, you can delegate each user's task (request or approval) to another user or a user-level organization role and specify the stand-in period as well. Note that the global settings will be applied unless you configure the user-specific delegation. Unable to use the Date filter in custom reports that contain quotation marks in additional fields. In the Technician form, long names of Group, Site, and Role are truncated in the respective selection boxes. In the Assign Users dialog box opened from the workstation list view, requesters removed from the application after the probe scanning are also suggested. Under Setup >> Probes and Discovery >> Network Scan, the scan failure message is sometimes not updated in the last scan summary of individual networks. The volume-type software license allocated to multiple workstations is deallocated from all workstations when the site of the owner of any workstations is changed. The Remote Control Settings dialog box that can be accessed from Actions of any workstation details page will have the Prompt user option selected by default. Under Home >> Announcements, announcements will be sorted in the descending order of Scheduled Time. In purchase orders, you can directly enter Discount, Sales Tax, and Additional Tax amounts. Accordion: Assets and Components sections will now contain the Asset categories. IT Desk - IT and Non-IT assets will come under Assets and Components. Facilities Desk - Facility-based assets will come under Assets and Components (Safety, HVAC, Appliances). Favorites section added under Assets module. Set a maximum of 15 product types as Favorites. Display Asset List in the Template View. Add Product Classification to categorize product types under the Facility desk. Product Classification is available only for Facility desk. Use representative icons to add Product Types. Default product classification and product types now available for the Facility desk. Export assets or components as a CSV/XLSX file from Setup-->Data Administration--> Export Data. The List View page will now list Table view operations on the left and Add operations on the right. In task notifications, the AssociatedID variable will be replaced with the Display Id of the associated entity. Custom views under Changes contain variables, such as Today, Tomorrow, and the like for Date fields. Address prefix (two hashtags) has been removed in purchase order details page, print preview, and notifications. Unable to edit request-related custom reports that contain restricted fields after the downgrade from Enterprise to Professional edition. VIP privilege of users is not preserved after syncing ServiceDesk Plus Cloud with Active Directory. Under All My Groups in the request list view, all requests in the technician's group(s) are displayed even if that's beyond the technician's scope. Requester's site will be assigned for the request in the following case: requester's site refers to the default site settings for Technician Group; requester logs a request by emailing a technician group; the technician group is configured with the default site settings. CMDB is a centralized repository used to store Configuration Items (CIs) and their Relationships. CIs could be Assets, IT Services, Users, Support Groups, installed Software Applications, Documents, Business Services that are critical to your IT environment. Define CI Types and their fields you would like to manage. Extend the CI Types and inherit the fields and relationships of the parent CI Type. Create and manage CIs of your IT environment and track their relationships. Use Relationship Maps to visualize the CI relationships to perform better impact analysis. Keep a track of all Incidents, Service Requests and Changes raised for the CIs. To read about the CI Associations, click here. Configure Business Rules and Triggers for Incident/Service Requests based on the CIs. When a reply template is used in a request, redundant Request ID references are added to the notification's Subject. The requester list view invoked from the request form is truncated when huge records are displayed per page. In change requests, the user's latest approval action is displayed in the approval status even if the change workflow is configured with the First Response Action. Workstation scanning now allows domain names up to 100 characters. Unable to copy workstations. The issue occurs only when Total Slots of the workstation is returned as empty instead of null during the scan. Empty fields of the organization address are inaccurately displayed in purchase orders. Purchase order attached as HTML to emails has a broken layout. The issues occur in emails sent to the vendor and the purchase order owner and when the purchase order is placed through an email. Line spacing issue in emails containing scheduled reports is fixed. Under My Schedule >> Mark Unavailability, the name of the To field is inaccurately translated in Finnish. A request approver with no scope to view the request is unable to download attachments in the conversations. Unable to update a request to any Completed status and simultaneously add work log from the Resolution tab. The issue occurs only when Work Log is mandated by using Closure rules. Unable to attach files with reply or forward notifications for requests. The issue occurs only when you switch between Requests and other modules. CAB members configured as approvers in the change workflow do not receive approval notifications. Unable to view the unassigned requests when the technician field is set empty is the requests custom filter. It has been fixed. Requester's reply is not appended in the technician notification enabled with Notify Technician when a new reply is received from the requester option. It has been fixed. In the request list view, Technician Group filters display all requests instead of pending requests under the selected group. It has been fixed. Unable to update the resolution along with the request status update. It has been fixed. For technician groups enabled with When a request in this group is left unpicked, notification is sent to all group technicians instead of the selected ones. It has been fixed. Requester's reply is not appended to Conversations for the closed requests enabled with Append the reply as conversation to the request and notify technician. It has been fixed. A technician without the Stop Timer permission couldn't resolve requests. It has been fixed. The new Template View option under Table Settings shows more details of each request in a compact view. You can mark requesters as VIP Users. The technicians can set conditions in SLAs, Business Rules, Triggers, and Form Rules in such a way that they can prioritize requests from the VIP users. 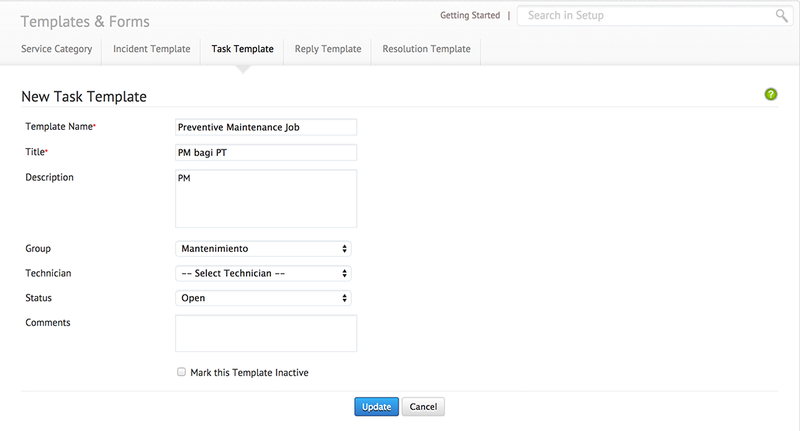 You can now plan Preventive Maintenance Tasks for service requests, as well. Copy an existing service request and customize the request details as per your need to create a new service request. Option to add attachments to the resolution of a request. While creating service requests from templates configured with the 'Approvers' field, requesters can select the first-level approvers. Convert 'Unapproved' service requests to incident requests under Request details page » Actions. You can now change the template of a service request from the request edit page when none of the approvers has approved the request. While attempting to change the template of an incident request, the user will need to choose whether to overwrite the existing values for all fields, or for only empty fields, and/or delete tasks from the previous template. The following new actions have been added; Show Resource, Hide Resource and Clear Field Value. The following new fields have been added; Approval Status and Update Reason. 'Date/Time' field is included under the 'On Field Change' option. 'Logged In User' and Requester fields such as Department, Job Title and VIP User, added under the 'Form Rules' criteria. Requester field added under the 'On Field Change' option and 'Enable/Disable' actions. 'Approvers' field added under the service Form Rules criteria and actions. 'Time' filters will be applied to the Custom filters created by users. Henceforth, only SDAdmins will be able to add/update/delete public filters. Earlier, all technicians were able to update/delete the public filters. Technicians, even if they have the ModifyResolution permission, cannot add/edit the Resolution of a 'Closed' request if they don't have the EditingClosedRequest permission. Responded Time will be set if Resolution is updated from the Edit Form, as well. The existing field values will be retained when the user changes the template in Preventive Maintenance Tasks. Admins can choose the type of notification (Email or SMS or Push) for Requests under Setup » Notification Rules. Also, the SMS option is available for more request notification rules. Task and Work Log icons has been replaced with the texts in the Requests list view header. Additional fields in ServiceDesk Plus cloud can now be included as user defined fields in Zoho Analytics. You can now include archived request data as part of the data upload from ServiceDesk Plus cloud to Zoho Analytics. Choose when to start and stop the data upload. You can also clear the uploaded archived data or choose to re sync it. SDAdmins can now take control of the database of a technician who has left the organization. Earlier the database will get locked up if a technician were to leave the organization. Attachments containing the same name are preserved when an email is fetched inside ServiceDesk Plus Cloud. EML files will be preserved as Attachments when an email is fetched. Earlier, the EML file was appended to Description. Specify Number of Licenses when you receive software licenses through purchase orders. Earlier, the license count was determined automatically through License Key. Under business rule conditions, Service Category is now available as criteria. Color code of Priority is not displayed inside the request details page. It has been fixed. The Merge option across Requests is inaccurately translated in Brazilian Portuguese. It has been fixed. Expiry Date of imported assets is displayed incorrectly if the date provided does not match the Import Wizard format. Note: During import, values in unsupported formats are always ignored. Additional fields are not displayed alphabetically in the new asset form and in the details page. It has been fixed. You can now save the Workstation form without providing HardDisk - Capacity (in GB). Product Type when edited between Workstation and Server under Admin >> Customization >> Asset Management >> Product is not reflected in all associated assets. It has been fixed. System Log couldn't be exported under Setup >> Data Administration >> System Log. It has been fixed. While adding a solution or a workaround to a problem, options in the Topic drop-down are sometimes hidden if you toggle between the two tabs (Solution and Workaround). It has been fixed. When Scheduled Start of a change is set at 00:00 hours or 12 am on the first of any month, the Calendar displays a past date. It has been fixed. The Software License form displays only the first hundred vendors in the Vendor list view page. It has been fixed to display all the vendors in the application. New site added for Billing or Shipping address from within a purchase order is not saved when the site's postal code contains spaces. It has been fixed. You can now organize Service Request Business Rules under Automation >> Business Rules. Resizing the notification template dialog box under Setup >> Automation >> Notification Rules was not possible. It has been fixed. When a technician edits and saves a custom report that's created and scheduled by another technician, the report is deleted. It has been fixed. For requests that are created through email, the Conversations tab will display the To and Cc fields. You can now export or import all change conversations. 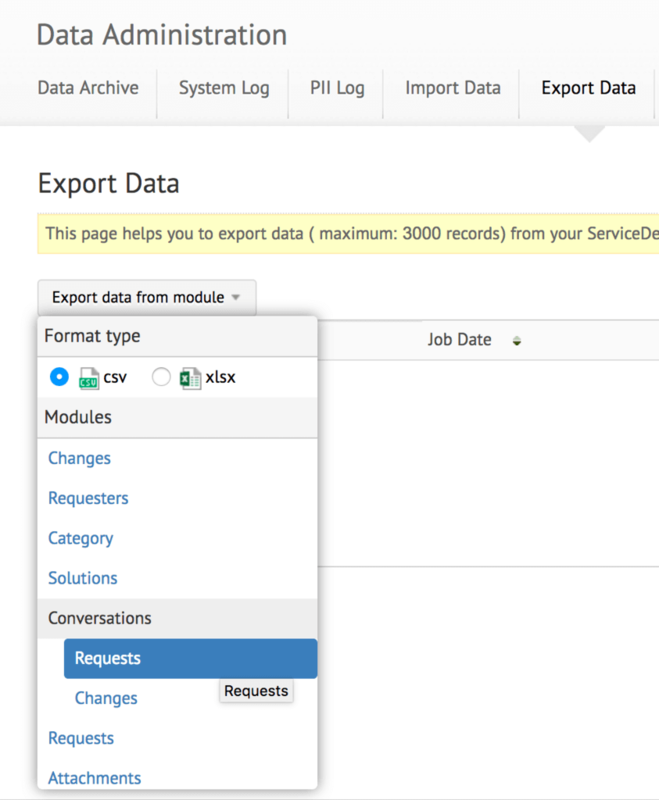 To export, go to Setup >> Export Data >> Conversations >> Changes. To import, go to Setup >> Import Data >> Conversations. You can import request and change conversations from a single file. Request Association in the Change Details page, now contains Sub Category and Item columns to allow you to search and associate requests based on those fields. Change dashboard widgets such as Approved Changes and Unapproved Changes now display the Change ID, along with the Change Request's title. Notifications under Setup >> Automation >> Custom Actions >> Notifications for Changes will be pre-populated with the Send Notification for Change template configured under Notification Rules. The Pending Approvals icon will list the unattended change approval notifications for completed levels as well. Approval actions are disallowed for changes in the Closed-Completed stage-status, and will not be listed under the Pending Approvals icon. For tickets created using group's mail, even after changing the group, replies are sent to the previously configured group's email. It results in duplicate request creation. It has been fixed. Create a software license with downgrade rights. While purchasing a software license, users can also choose previous versions of the software for which the current license can be used. Users can upgrade existing software licenses when the software vendor releases new version. New fields are available under assets: Created Time, Created By, Last Modified Time, and Last Modified By. Form field in the asset details page is enhanced with Spot Edit. List of all User Interface/Functionality enhancements in Assets and Software module. Configure prohibited software notification under asset notification. Resources from now on will be referred as Assets and owner will be referred as User throughout the UI. Major/minor version functionality is replaced with downgrade rights feature. Existing major/minor association is handled in migration as below. If you had already grouped major/minor versions, both versions of the software will be shown in the scanned software list view. If you have added software licenses for major/minor versions of a software, the software license will be associated with the major version of the software, and downgrade rights will be created for all the minor versions of that software. E.g. Let's assume Adobe Photoshop 9.1 and Adobe Photoshop 9.0.1 are in the scanned software list view. And, you have grouped Adobe Photoshop 9.0.1 as minor version under Adobe Photoshop 9.1. If you have added a software license for Adobe Photoshop 9.1, after migration, the license will be mapped to Adobe Photoshop 9.1 with downgrade rights for Adobe Photoshop 9.0.1. The number of entires in any report generated from the application is limited to 15000. If there are more than 15000 entires in your instance, use filters to adjust the count and generate the report. You can now import and export requests with the Resolved Time. The system field Resolved Time is added under Data Administration » Import Data/Export Data » Requests. During the request merge process from the list view, the earliest logged request is, by default, selected in the parent request selection window to ease the process. Also, the requests will always be sorted by their Ids in the parent request selection window. New variables - Closure Code and Closure Comments are added in the request notification templates. You can now click the pop-out icon to open the link provided in the Web URL additional field from within any details page. Workstations are not saved when Warranty Expiry Date is specified without the workstation's Expiry Date. It has been fixed. Inside a change workflow, Stage Status Notification is not saved if any role containing parenthesis in its name is added to Role to Notify. It has been fixed. Value for the $LatestComment variable is displayed empty in the notification sent to the associated entity owners upon task completion. It has been fixed. Users could not assign a technician to requests located by using the Global search button at the upper right corner. It has been fixed. Users couldn't create and associate a Jira issue with a ServiceDesk Plus request from within the request details page. Empty issue form is displayed when the same is attempted. It has been fixed. The request notification rule Acknowledge E-mail Cc users when a request is resolved is incorrectly translated into Spanish. It has been fixed. The name of the field State in Assets is incorrectly translated into German. It has been fixed. A static footer bar has been introduced in the screen of ServiceDesk Plus account with functionalities, such as Live Chat and Feedback organized for users' easy access. Import Components along with user details, including department details, in all file formats. Value for any Multi-Select field in a request is not saved if the field is mandated through template form rules. Incorrect Job Title displayed in the request form when a duplicated requester name is selected. It has been fixed. SDAdmin could not delete task dependencies inside the default incident template. It has been fixed. When configuring a form rule action with Add or Remove Options for Item, the items are not listed in the drop-down if the sub-category count exceeds 100. Software Version of scanned systems not displayed in the UI. It has been fixed. The value for Speed in Switches is displayed as zero in the UI if the actual value exceeds the integer limit configured in the database. Servers updated as workstations continue to be listed under Servers. If the Model Name of workstations is not specified during import, existing names will be preserved and not changed to Unknown Workstation. Warranty expiry notification for workstations is delayed by a day if Warranty Expiry Date is edited in the workstation details page. It has been fixed. Notification is not triggered when a user is assigned an asset from the right panel in the asset details page. It has been fixed. In CSV export of reports that hold summary, certain column values are shifted to the successive columns. It has been fixed. When you add users to verified domains from the ESM directory or enable login access to existing users of verified domains in the application, they will be shared a one-time password via email, with which they must log in to the application and reset their passwords. Organization Admin associated with any role can now update URL for Organization Portal. Configure specific time zones for each instance under ESM Directory or Instance Settings. The default setting is the organization time zone, which can now be modified. You can now have URLs without Top-Level Domain (without any domain extension) the Web URL additional field. The URL must contain HTTP, HTTPS, FTP, or SFTP protocol. At times, surveys from users with multiple instance login are logged in the wrong instance. It has been fixed. The Probe will use the Ping command to fetch the alive hosts list if NMap command fails. When the selected language is Japanese, the name of the To field is translated incorrectly under request conversations. It has been fixed. The Reported By field appears empty during Problem edit. It has been fixed. The name of the Exchange Rate field is displayed incorrectly in purchase order payment forms when the vendor currency is different from the base currency. It has been fixed. Non-admin users were unable to download the request attachments uploaded through API. This issue has been fixed. The request form does not display Category values in IE browser if the applied form rule has the Add and Clear option enabled. This issue has been fixed. Change module search being retained forever is fixed, by dropping the search when clicking on the Change module tab. Removed "more/less" button shown in Service Request form when there is long list of resource questions in Resource Details. Problem in creating request through requester login using the mobile browser is fixed. Issue in Problem closure rule is fixed. Support for Clickatell's latest API provided. Solution attachments will be shown below the solution description in inline view of Solution from Solutions List View. Click here for more details regarding the end of support for older TLS versions. Device type configured in asset details page will take the priority in determining the asset's OS during the probe scan. Software installation/uninstallation is not displayed in workstation Scan History. It has been fixed. The Task Dependency Management page in Requests, Problems, Changes, Projects, Request Templates, and Project Templates has been revamped. Users with view permissions can now see the task dependency map in Requests, Problems, Changes, and Projects. Task dependency map is now available in full screen and a progress bar indicates the percentage completion of the tasks. Improve your project team's efficiency by mapping task dependency across a project, and not only between milestone tasks. Mark dependency between any two tasks within a project template between project template tasks and/or milestone template tasks. In service templates resources, options for the Select box and Check box questions can now be reordered. Zero value can now be set for additional fields in service and incident templates. Notifications of Close-Cancelled changes will be removed from Pending Approvals panel. Workflows with intricate node connections are garbled in the latest version of the Edge browser. It has been fixed. The Log Viewer inside a change workflow displays false user names for Performed By field. It has been fixed. In change workflow Log Viewer, entry for a failed execution will be preserved instead of being replaced by the corresponding completed execution. In the Calendar view, the Scheduled Start Time and Scheduled End Time fields have been renamed as Scheduled Start and Scheduled End, respectively. In the Calendar view, Day mismatch occurs when the week is not set to begin from Sunday. Push notification evoked on account of workflow failure will now be displayed with change ID. Notifications configured in workflows are sent with empty content for HTML input fields. It has been fixed. In the project form, Projected On field has been renamed as Projected End. This change will be effected across the product. Milestone task organization in a project template is lost when the template is used to create a project. It has been fixed. In project, milestone, and task details page, fields are organized to display the most relevant information. In the list view and print preview of purchase orders, Created Date is displayed as Ordered Date. It has been fixed. Under the organization details in the ESM directory, any valid website can now be saved. Site and Department fields have been combined into a single, more effective field in the Requester form. In reminders, irrelevant message is displayed upon choosing past days if the application is personalized to certain Date/Time formats. It has been fixed. In the Pick List additional field, options couldn't be reordered. It has been fixed. When webhooks are executed, the variable $Description is not replaced with content if the content has HTML tags. It has been fixed. Text formatting and line spacing issues in notifications have been fixed. New feature to track all request-related activities when two or more technicians work on the same request. Technicians will be notified on each others' activities through float notifications in the Request details page. Attachments in public solutions are not visible to requesters. It has been fixed. Workflow execution of a change stops if the change has enormous data and when an approval action is performed. Service Catalog is now available as an add-on for Standard and Professional editions. Closure rules configured in the Enterprise Edition are preserved even after the application is downgraded. This issue has been fixed. When a business rule to be executed on service request creation is configured using custom functions, the service request creation is terminated. This issue has been fixed. Improve the quality of the how-tos, articles, workarounds, or resolutions published in the Solutions module, with more user interaction with the content. Users can now like or dislike the solutions, helping the team enhance the quality of the content that is published. In addition, users can comment on the article and link relevant articles or pages. Display important messages on your technicians' home page in just a click. Know at a glance, within the Requests module, whether a technician is online and available. A green button indicates online status, and a grey button indicates offline status. Technicians can make their work logs as the first response to a request. Allow technicians to select from work log types. You can configure the work log types under Setup>>Customization>>Helpdesk. Configure Self-Service Portal settings to allow technicians to include non-operational hours in their work logs and work log timers. You can now merge service requests raised using the same template. In addition, you can merge these service requests with one or more incident requests. Mark the parent request in the Request list view while merging requests. Some of the associations of the child request will be moved to the parent request after the merge process. SDAdmins can now configure closure codes that technicians can use while closing a request. Associate multiple assets to service and incident requests. This will be fully reset when the requester is changed. Under Conversations, you can resend the technician reply, forwarded, and system notifications. Add comments while linking requests in the Requests List View page or in the Request Details page. Use the My Pending Requests or Tasks filter to display a consolidate view of pending requests and tasks. Execute business rules within/outside operational hours or at any time. Configure a business rule action to update the Template field of an incident request. The Template field is now available in the fields drop-down under Business Rule actions. 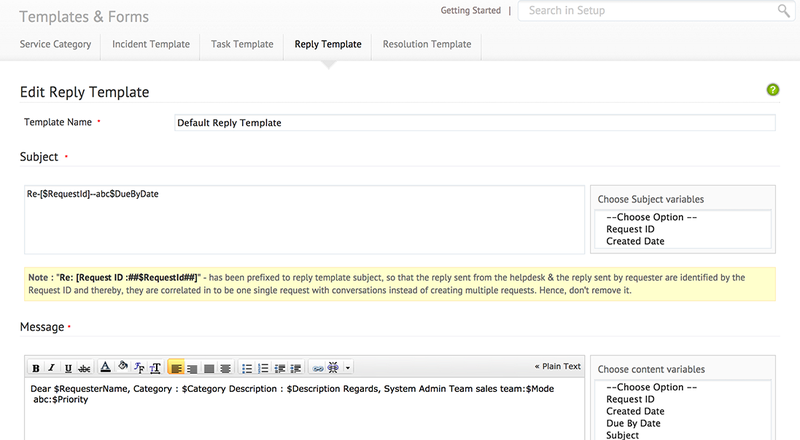 Configure form rules to set, unset, hide, and show tasks in some selected request templates. Schedule approval reminder notification (requests, changes, and purchase orders) to be sent when the approver fails to respond within a specified time. This notification will be sent over three consecutive days. Allow your technicians to add comments for any status change in a request. You can also mandate the comment. In the email notification for note addition, variables were not rightly replaced by values. It is now fixed. Form rules not copied when the incident/service request template is copied. It has been fixed. To get your Probe and Provisioning tools to support TLS 1.2, the .NET Framework 4.5 installation will be required in the respective tool(s) running machines. A banner will now be shown in the application for the Admin(s) to select the automatic or manual installation of .NET framework 4.5 in those machines. Line break issue in request's notes when copied and pasted from external editor is now fixed. HTML content in the workaround of a problem's solution was displayed as HTML source in print view. It is now fixed. Request duplication upon reply to a technician group'ws email address is now fixed. The HTML export of a report will be saved in the report name. Issue in displaying changes in the calendar view is fixed. Issue in saving form rules without providing criteria is fixed. Project additional fields were not shown in the add, edit and details page of projects for non admin users. This issue has been fixed. You can now execute Triggers and Business Rules with conditions based on request's Approval Status and Group. When a requester sends a request to a group email address that is duplicated for multiple groups in different sites, the request will be added only to the group present in the requester's site. This integration allows automatic sync of technician's leave records in ServiceDesk Plus and Office 365 Calendars. It also allows users to copy ServiceDesk Plus reminders to the Office 365 Calendar. This integration allows to create and link Jira issues to requests from within ServiceDesk Plus. This integration acts as an additional authorization step to Azure AD Single Sign-On. It allows you to import users' department and site details in addition to the users' basic information from the Azure directory. The add-in lets technicians and end users perform a host of help desk activities from their mailbox. Change notification sent without any text content was neither recorded in the change workflow nor listed in the Conversations. It is now fixed. Unprivileged users were able to view change notifications created through custom actions, which is now fixed. In a change stage status notification, users couldn't add and save more than one role at a time in the Roles to Notify field. It is now fixed. Notification sent upon changing a change's status specify only the previous stage, status, and field values. It is now fixed to display the new stage and status along with field updates. When you close or cancel the Close stage in a change, the progress indicator next to the stage turns from orange to green. Closure rules will not be checked anymore when a user tries to cancel a change request. In the change calendar view, you can now view the scheduled start and end time of a change upon hovering the change. You can now view the change IDs of pending approvals on clicking the notifications. In the change calendar view, you can now view changes IDs in addition to the titles on clicking a date. "Loading" message will be displayed until a change is opened. Upon enabling Notify technicians when the asset warranty is about to expire and/or Notify technicians when asset/license is about to expire in Asset Notification Rules, asset owners were also notified. It is now fixed. An alert message will be displayed when non-SDAdmin users access the Provisioning Tool. Third party library for SNMP devices is upgraded to SharpNet v1, v2, and v3 to support a wider range of devices. OIDs of SNMP devices are no more duplicated in the Unknown OIDs list. 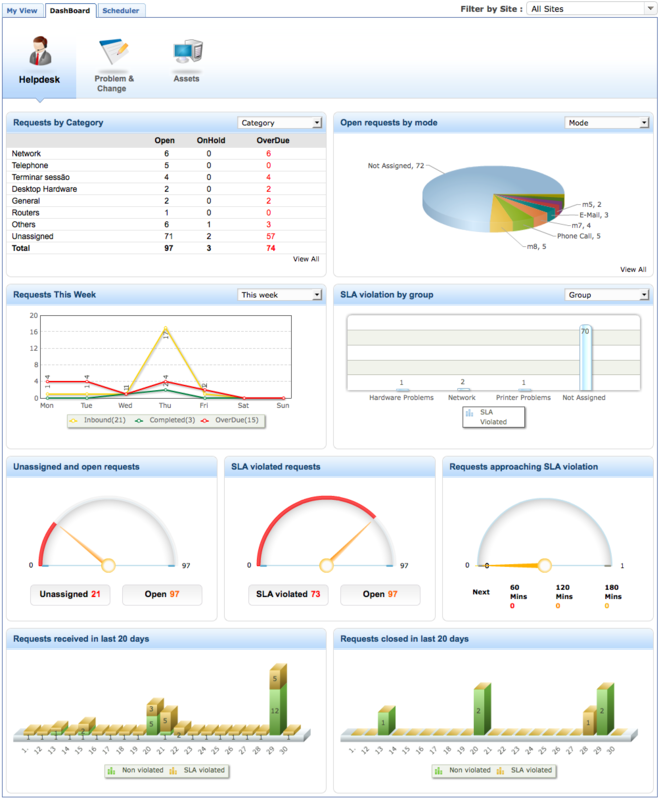 When the application is in Japanese, users couldn't generate custom reports of the Ring chart type. It is now fixed. Upon editing and updating a scheduled report, the report schedules were deleted. It is now fixed. In the ESM directory, you can now bulk edit user's Country. In the contracts list view page, Maintenance Cost of the contracts is now displayed up to two decimals. An empty alert message was displayed when users reconciled a resource (without actually selecting the resource) from within a purchase order. It is now fixed. Encryption at Rest (EAR): You can now designate additional fields as encrypted at rest (in the database of ServiceDesk Plus servers). And just to clarify as usual, all traffic, including fields that are not encrypted at rest, continues to be securely transmitted and encrypted between ServiceDesk Plus servers and your browser. New field types have been introduced in additional fields across all modules. You can set constraints such as minimum and maximum values to specific fields. You can now mark out Email and Phone additional fields in Request, Requesters, and Technician modules as Personally Identifiable Information (PII). Refresh alerts for product updates will now show up as a banner with a Refresh Link. Tap the Refresh Link to stay inline with the latest updates. Admins can now configure Organization Roles in SLA Escalation. Time Taken To Resolve field in Work-log will not be default to zero hours or minutes. Admin can now configure Requester's reply template in the Request notification rules. Only resources that have the questions answered will be displayed in a request details page. Unable to convert requester to technician if the requester has the Reporting To user assigned. It's has been fixed now. Caching issue in user level organization role is fixed, where approval was being sent to the user even after he/she was disassociated from the role. License validation for over used technician count is now corrected. User details like full Name, mobile, phone and Email updated in accounts will now be synchronized with the application when user changes his/her primary email address. Configure how your user's confidential data must be securely used within your organization. Mark out Personally Identifiable Information (PII) explicitly so that it can be easily and effectively removed from the application when the user exits the organization. Requests were assigned to technicians on leave, which is now fixed. The issue in stopping worklog timers after emailing technicians is now fixed. When creating a request from within another request details page, users couldn't associate assets to the new request. It has been fixed. Statuses of approval-awaited requests with stopped timers weren't set to Custom On-Hold (as configured in self-service portal settings). It is now fixed. Purchase order cost isn't updated upon editing Price, Tax Rate, or Quantity of multiple items in one go. It is now fixed. Products are now listed alphabetically in the drop-down of purchase order edit pages. Multi-line texts in Remarks and Terms are displayed correctly in purchase order approval and print pages. A new variable $POName is available to add to purchase order notifications. The occurrence of empty rows in XLS, XLSX, and CSV file formats of default query reports has been fixed. The issue in organizing business rules has been fixed. A new Search option is available to filter sites by regions. User Sign up is available in mobile browsers. Business Rules and Triggers now support Custom Function in the enterprise edition. Business rules will be executed on requests as users perform pickup or assign actions in the list view page. Issue in assigning a technician to a problem if its notification content has $ variable. It has been fixed. Description field in announcements and change roll-out plans has no minimum length now. Configure new roles in an organization's different hierarchical levels namely - Organization, Region, Site, Department, Group and User levels. With organization roles configured, you can enable the role based approval process in service requests. Enhanced user interface with options to categorize the announcements into various types, add priority information, and attachments. Filters in the list view have been upgraded to All, Active, Scheduled, Expired Announcements. Enhanced Change Management module with workflow, stage and status, change roles, change templates, enhanced change approvals, and more. Change Template: Option to create multiple change templates and specify a workflow and assign change roles to each template. Change Workflow: Capture the complete change life cycle, along with its stages, statuses, conditions, notifications, approvals and field updates in a workflow by using a graphical builder. Stage and Status: Six stages of the change life cycle now includes submission, planning, CAB evaluation, implementation, review, and close. Each stage has its own status list. Under each status, configure roles to whom the notification should be sent when a change comes to that status. Change Roles: Define various change roles for the organization, such as Change Implementer, Reviewer, CAB Member, Line Manager. The scope of each role is defined under various stages. Change Approval: Enhanced change approval to support multi-level approval and multi-stage approval through workflow. 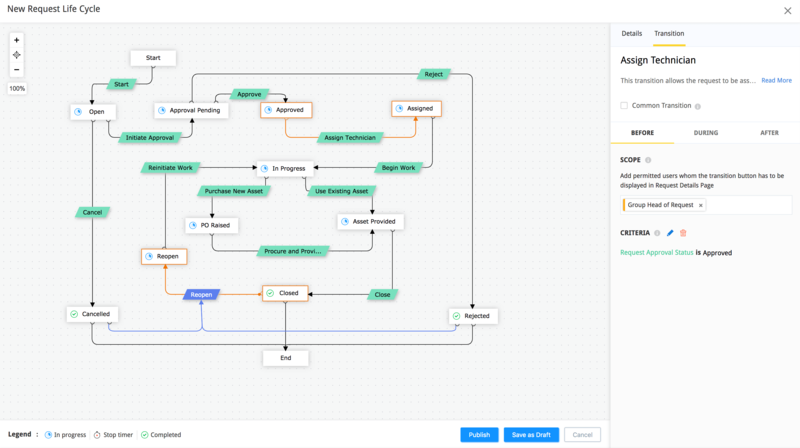 Option to view the entire life cycle of a change, along with the complete execution path of the workflow through the Workflow Execution graph. Option to add closure code, downtime, reason for change, and risk involved in a change. Custom Views and Trash Support added for Changes. Support added for requester to view/edit/approve Changes. Customizable Change ID and module prefix support are added for the Change module. This can be configured in the Self Service Portal settings. 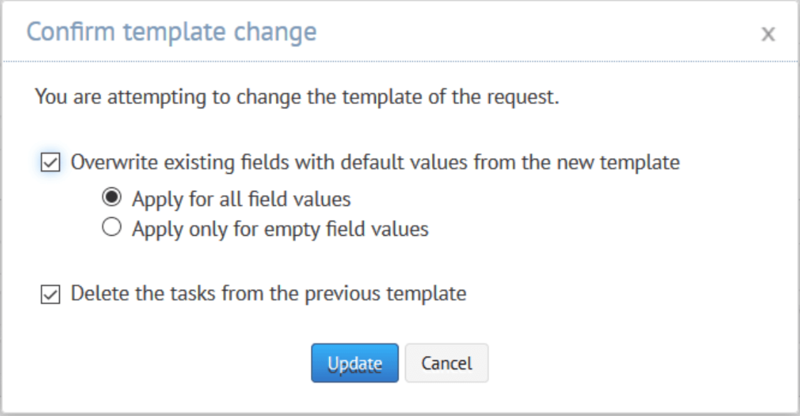 With the release of the change template feature, all current change requests in the application will be automatically migrated and assigned with the default template (General Template), along with the additional fields. With the introduction of change stages into change life cycle, we have consolidated change stages and statuses. Change statuses are now stage-specific and each stage is configured a few statuses to which you can add more. SDAdmin(s) can start migrating the current statuses under specific stages. Option to scan the standalone workstations that are not part of the network using the script / selfscan.exe and update scan details onto the ServiceDesk Plus Cloud. Option to configure the product type and model for the Unknown OIDs of SNMP devices fetched during scan. Option to view summary of the last scan that will have details of the previously concluded scan. It can be viewed from the network scan / domain scan list view page. Option to enable/disable software scan in Mac/Linux machines during Network/ Domain scans. Software scans will not be performed by default from nowonwards. Business rules now comes with enhanced functions and a new user interface. Users can use business rules on requests that are deleted and also to abort any process execution. Users can now configure Field Update and Notification as custom actions right from the Business Rules Configuration page. The Notification action configured here will be automatically populated under the Custom Actions feature. Triggers are automated workflows that occur when certain conditions of an incoming request are met. Triggers are essentially post database operations and can be used extensively to configure actions independent of requests as well. Users can now configure Tasks, Notification and Webhooks as custom actions right from the Triggers Configuration page. All the custom actions configured here will be automatically populated under the Custom Actions feature. Webhooks enable the user to call any external URL or API to integrate ServiceDesk Plus On-Demand with any third-party application. The changes in the default settings business rule configuration will no longer be linked to the configurations in the copy sites once created. The default password of the users for the verified domain has been changed. The Default Settings in the Site filter drop down of Business Rules was not available to the SDAdmin role which is now fixed. Pie graphs display the values with their legends across the module. User defined Additional columns are displayed under Request Metrics in new custom report. Newly added or modified reports are listed under System Log of Data Administration. The options, This year and Last year are appended to the Date Filter in a new custom	report. A scheduled report has date and time appended to its subject. We have now introduced Enterprise Service Management, a functionality that lets you create and deploy service desk instances for your non-IT business functions-like HR, facilities in addition to the IT Help Desk. Create separate instances of ServiceDesk Plus for each of the business functions. Requesters and Technicians can view all the available instances through a common Portal. Mark any of the instances as the default ServiceDesk Plus instance, so users can access their help desk easily. The following configurations (which were previously available under the "Set up section") have been moved to the ESM directory. New service desk instances can be created and deployed in the "Service desk instances" section of the ESM directory. The "Users" section can be used to manage user access to the different service desk instances. The "Admin" tab in each instance allows specific service desk configurations and setup. More details at the given links.? Task owners will receive the scheduled reminder notifications as scheduled. When a request's SLA is modified, escalation time for the new SLA is into effect. A technician's reply to a conversation is made public only if the email's 'To/CC' field contains the requester's email address. You can view a date/ time field's calendar by just clicking the field. You can input a date to the field by double clicking the value on the calender. Project Gantt chart can now be viewed in full screen. It is now possible to import the microsoft project file with the upgraded software version. Start time under worklog remains unaffected upon editing the end time via API and the Time spent field shows the actual duration. It is now possible to load up to 50 milestones in the Project Gantt view milestone filter. Error handling has been introduced for URL widgets in the dashboard page. The E-mail Id(s) To Notify field can now be left empty. A requester's reply to a ticket is now added as a conversation to the existing ticket. The issue where the closure rule was not getting applied when worklog was added along with the request status changed to closed, when added/edited resolution has been resolved. Problems in Pick up or Assign actions in tickets assigned to the refer site are resolved. Issues in the business rule action to assign group for tickets in the copy site have been resolved. Pick up action is now captured in history. The issue in assigning requester name when multiple requesters have the same name have been fixed. Form Rules for Incidents & Service Requests with the form fields prefilled with the required values based on the conditions before creation. With the form rules , we can Mandate or Show or Hide fields, can Add or Remove options to a field , can Set value to fields etc., in the Incidents or Service Requests form. This is applicable for the user additional fields too. Option to restrict a template to specific groups to make sure that only technicians of the associated groups can view that particular template. Compose, display, and edit text in right-to-left languages such as Arabic and Hebrew. ServiceDesk Plus (Cloud) now extends full support for RTL layouts, including layout mirroring. 'Right to Left/Left to Right' text directional option will be available in all the text editors across the product for all the supported languages. The ServiceDesk Plus Office 365 Connector sends activity notifications to the user's Office 365 inbox. These ServiceDesk Plus notifications are sent as actionable messages that users can complete from within Office 365, without having to switch over to ServiceDesk Plus. Scan vendor barcodes and add assets. Generate and print barcodes for new and existing assets. Navigate through assets easily. A maximum of 300 Product types will be displayed in the accordion. Sync asset data with existing SCCM installation in your network. Scan various SNMPv3-supported devices, such as printers, routers, and switchers. Suggest owner based on the last logged-in information obtained during scan. Notify owner about asset assignment and retraction. Exclude IP address, host name, or IP range during device scans.. Unable to scan multiple workstations from the list view. This is fixed. Unable to view data through navigation in the Drill Down Analysis report, is now fixed. API will require the similar URL pattern or it can use x-sdpod-appid as Header Key and Portal Name as its value. Few changes in OrgAdmin and SDAdmin roles between the organization and the app accounts. Date Filter has been removed, the search result is always for the All Data. The newly enhanced Global Search feature for Requests enables users to find information easily. Users can search by fields, dates, and even by terms. Negate search allows you to refine your search by including or excluding conditions. Advanced options include phrases, wildcard, and fuzzy search. To know more about the search functionality, refer to this help guide. Issue where the inline image in the template gets deleted when its requests was deleted is fixed. Issue where the configuration value that had single quote was not synchronized in Zoho Reports is fixed. Enhanced cost details page for each asset, which is summarized as Purchase Cost, Operational Cost, Current Book Value and Total cost of ownership. The Total Cost of Ownership indicates the total sum of all the costs spent on purchasing the asset, asset's operation and disposing it. It also includes the component cost. Service cost, Move/Change cost and others costs will be added as Operational cost. For more details, refer our online admin guide. The categorized Asset costs like Purchase Cost, Operational Cost etc.,are now available as columns in List View and Reports. Purchase Cost given in add Asset page will automatically be associated with the chosen Vendor for that Product, if the Product cost is not associated to its Vendor. Last visited Assets List view will henceforth be remembered. For example, when a user switches tab from Workstations list view to other tabs and revisits the Assets tab, the last visited Workstations list view will be displayed. During Asset import, the Product type of an already existing product will be checked. If the Product Type is different in the record to be imported, then that record's import will fail.? Asset Warranty Expiry & Asset Expiry notifications can now be configured in Admin page.? Issue where the due by time was shown wrongly in the Request details page for closed requests is now fixed. ? New columns like Software name, Software Type, Compliance Type and Software Manufacturer are now added in the filter criteria of Workstation Reports. Reports can now be generated to get a list of all Workstations with a particular Software installed and Workstations with that particular software not installed. Issue in displaying Request metrics data, Average Response Time, Time taken for First Response, Requester and Technician Reply count in canned Reports has been fixed.? For the first time, you can customize your dashboards page by adding new dashboards and widgets. You can organize a dashboard by rearranging and resizing the widgets. You can add widgets across modules such as Helpdesk, Assets, Projects, Problems, Change, etc., under a new dashboard. You can also add URL widgets to the dashboard with links to your organization's intranet page or resource page. You can group widgets to accommodate more widgets in a single dashboard. With the Private and Public dashboard options, you can control who views your custom dashboards/widgets. To know more about dashboard customization, refer to this help guide. Multiple files and screenshots attachment support in the feedback tool. Copy and Paste issue from the MS tables to the editor is fixed now. Extra space that appeared for mails that were sent from outlook or when the contents were pasted from the MS word is fixed now. Strike option getting disappeared in the editor after multiple save is fixed now. Edit option for the public reports by all technicians will work now. Russian fonts not getting displayed in PDF reports is fixed now. Japanese characters getting garbled under reports is fixed now. We have introduced new default roles in-addition to the existing roles. These roles when assigned will enable the technicians to perform configurations seamlessly. The roles are HelpdeskConfig, AssetConfig, AnnouncementConfig, ContractConfig, and PurchaseConfig. Please refer to the help guide to know more about the privileges of each role. Searchable drop down list for Site, Department & User, Product Name or Model in Asset and Workstation has now been provided. Performing search in Asset Global Search and followed by the Edit action will now be taken to the respective resource page. Asset count will now be shown individually in Asset Dashboard, IT & Non IT Assets. Probe scan will now work in Windows 10. Issue where a pick list type Project additional field failed to show the values is now fixed. Issue in displaying the default font size in the Editor is now fixed. Issue in importing Workstation(s) is now fixed. Sorting issue in displaying data in Groups, SubCategory, Item is now fixed. A new option called 'Credential Library' has been added to 'Probes and Discovery'. Technicians can now configure new scan credentials, edit them in a single place and this will be mapped to the associated networks and assets. Credentials previously configured will be migrated automatically to the Credential library. Please refer this help document for further information on this feature and the migration process. Tasks could not be closed in cases where the estimated effort was enabled in the task closure rule and its value was set to '0'. Task dependencies will henceforth be captured in the module's history. Issue where the tasks were reopened on edit when the Task closure fields were violated, is now fixed. Bulk closure of Tasks will henceforth work based on its dependencies. The description from the request template did not get copied when a request was created via API. Issue where editing notes removed all the styles applied to it, is now fixed. Track a technician's effort with the Work Log Timer: Technicians working on a request can activate the timer to track the time spent on each request. Different timer icons represent if the current technician, some other technician, or no technician is working on the ticket. For the Work Log Timer icon to appear in the list view, select it in the Column Chooser under Table Settings. Identify incident and service requests easily: Incident and service requests are now available on the Request List View with representative icons. View requester mails in queue: The number of requester mails awaiting the technician's response on a request is now displayed in the notification area. Be warned of an approaching SLA: A yellow flag next to the due by time appears when 70% of the total SLA time for completion is exhausted. 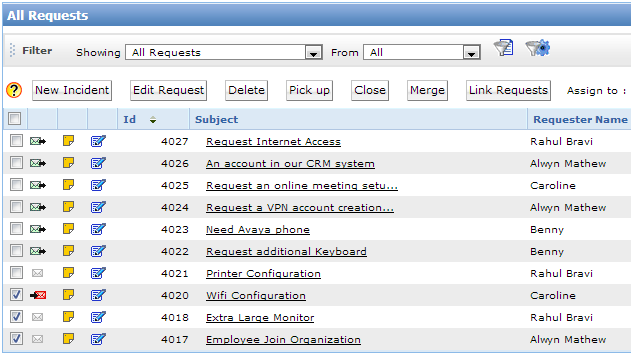 Get all task-related information at a glance: All tasks under a request are displayed in the list view. A mouse over on the tasks displays details such as the total pending tasks, completed tasks, and assigned tasks. For the Tasks icon to appear in the list view, select it in the Column Chooser under Table Settings. Monitor SLA timelines: The list view displays useful SLA timeline information such as time left until SLA breach and time elapsed since SLA breach. The Due by column has now been renamed as Due by Date. For the SLA information to appear in the List View, select the Due by field in the Column Chooser under Table Settings. Allow requesters to view all requests: Configure admin settings to allow requesters the option to view all requests. Access merged and archived requests easily: Requesters and technicians can now search through merged and archived requests by preceeding the request ID with a hash tag (#). Note that this facility is available only on requests merged after this release. Serve your requester better: The Last updated time will also be updated for the latest assigned time of requests and the time of last reply to a request by a technician/requester. Make ticket conversations and notes public or private: Technicians now have the option to mark the replies and forwarded mails as public or private. The technician can selectively expose some replies or forwarded mails to the requester by toggling the Lock icon. A check box on the reply and forward form allows the technician to mark the mails as private or public. System notification mails to the technician, such as request assignments, escalations, and group notifications, are by default set to private and are hard-coded. And, Email-cc users mails are public and hard-coded. Settings that are hard-coded cannot be changed. A clickable lock icon is now available to modify the privacy settings for the notes attached to the requests. Hide or show approval information to requester: The Self-Service Portal now provides you an option to hide incident approvals to the requester. The approval information is hidden by default. The technician can modify the settings in the Self-Service Portal to allow the requester to view all approval-related information. For service requests, this approval visibility option can be enabled in the service request template. Asset state change: It was not possible to change the state of assets whose owner details have been modified through import. This is now fixed.? Bulk allocate software licenses in a site: Bulk allocating software licenses associated to a site was not possible. This has been fixed. Enhanced date-time component: Pick date, hours, and minutes in one go. Timezone : Difference in Timezones between your system and the help desk if any will now be displayed at the top right corner. The issue where the user was unable to edit and set "Mark as completed" for a reminder after the reminder time/ date had elapsed has now been fixed. The issue where the print option was not working as expected for printing Incident/ Service requests due to misaligned html tags has now been fixed. When requests were merged, the links present in the conversations of the parent requests were hidden/disabled in the client. These links have now been enabled. Approval notifications will no longer be shown on clicking the notifications icon in the header for closed requests. Approval details were not being shown completely due to misaligned html tags. This issue has been fixed. Merging closed tickets will retain the parent request in the closed status. During request creation through requester login, Site/Group/Technician check not happening has been fixed. Selecting the option "Alert Technician by Email when a request is assigned" will not send notification to the technician logged in if he is the owner of the request. Issue in calculating the executed time in work logs has been fixed. The help card in Import Data page under Data Administration in Setup had a broken link. The correct link has been updated now. The issue where creating a user group with more users was not possible which has now been fixed. The number of characters that can be entered in the subject field of the 'Send for Approval' Email has been increased. Provision to enable/disable notification mail for "Disable new request creation through Email" has been provided in Notification Rules --> Request. MS Projects were not getting imported when tried from within the Projects Module for all languages except English. This issue has been fixed. The number of characters that can be entered in the contract name has now been increased. Ability to associate an already existing Product to the selected Vendor using "New Product" option in New Purchase Order has been enabled. For Task reports, Request IDs will now be shown in short instead of the usual long values. 'Insert' as well as 'Copy-Paste' options have been enabled in the reply/forward editor. 'Insert Table' and 'Insert Horizontal Ruler' options have been enabled in all editors. Request print command was not functioning properly in Internet Explorer. This issue has been addressed. In Reply Templates, edit icon was not working in Firefox browser and saved contents were not displayed in Internet Explorer. These issues have been fixed. Issue where the work logs were getting added to our database but were not getting displayed has been fixed. The count of records in the list views can now be fetched only when needed by clicking on the button on the list view. This change enhances the performance of all the list views. Copy-paste from clipboard and direct paste of base64 type images has now been enabled in the new editor. You can now drag and drop images/ files into the text editor where these will get added as attachments (if the said editor supports attachments). Assets were not being displayed under the 'Server' list view when imported in the form of csv files. This issue has been fixed. While scanning assets, when the scan failed in the first attempt, assets were added as 'Unknown Workstations'. If the scan was successful in the next attempt and if the asset type was categorized as 'Server', it got wrongly listed under 'Workstations'. This issue has been addressed. In the 'Edit Product' form within Asset Management, the desktop/ laptop options in the field 'Product Type' were not working properly. This has been fixed. Additional fields were not getting imported while performing software license import. This issue has been fixed. Admin was unable to create work logs for requests when not associated to the request's site. This issue has been fixed. In software license import, entering the license key was mandatory and leaving it empty resulted in rows not getting imported. This issue has now been fixed by making the license key field optional. Issue in SLA due by time settings due to time zone mismatch has been addressed. You can now create new Project Templates and use them while creating new Projects. Ability to add new Additional Fields in Projects module has been introduced. You can now import your Projects from Microsoft Projects (.mpp format). In the Gantt Chart view of Projects, you can now choose multiple Projects and Milestones in filters. Time sheets have been enhanced within Projects and within Milestones of Projects. In addition to viewing the cumulative work log of technicians, you can also view the task wise split up of the same. Several Tabular as well as Query reports have been made available for the Projects module by default. New columns like 'actual hours', 'actual cost' etc. have been added in Custom reports for Projects. The User Interface for the Dependency Mapping feature has been enhanced for tasks within Requests, Problems, Changes and Milestones of Projects module. The 'Close Request' and 'Survey' links prompted a login popup and displayed error messages previously which is now fixed. The issue in "Converting a Chat as Request" where the conversation was created without a description has been fixed. The calendar for Changes module was not rendered properly in IE & Chrome when the zoom resolution was set to 150%. This issue has been addressed. Want to know why a request took too long to get resolved? We have introduced the new Request Assessment feature that lets you view the specific details in the form of a graphical as well as textual representation. More details can be seen here. Note: The feature is applicable only on requests created after this release. Time elapsed is the time for which a request was effectively open. It is the time between the time of creation and completion of a request, excluding the non-operational hours and on-hold time. Time spent represents the effort put in by the technicians working on a request. It is determined by the work logs added by all the technicians who have worked on the request. Business Rule is now available for Service Requests as well. It will work in the same way as Business Rule for Incidents. It will be a site based setting and follow the same principle as that of Incident. There are separate lists of Business Rule for Service Request and Incident Requests. Copy Template option has been introduced in Service List as well as Incident List views. Templates can be copied from Service list to Incident list and vice versa. Also, edit template option has been added inside the Action tab. The copy limit is presently set at 5. Copying a template will add "_1" to" _4" as suffix in name. Default names will be taken from the template to be copied, with "Copy_" as prefix. When copied from Service to Incident workflow , resource(s) will be discarded. Option to search service template names has been introduced in Service Category list view. When clicked on a template, it will open its Edit form directly. You can now attach files while creating or editing a PMT. Also, you can conveniently add resolutions while doing the same by accessing the newly introduced Resolution field. Resolution will be copied if it is added in the Incident Templates. 'Requests Created Today' option has been added in the Filter view. You can now search and add assets using columns like, "Resource Tag", "Location" and "Serial Number" while creating or editing a request. During bulk edit of requests, the pick list values get set to none despite choosing the option 'Select' in order to leave it as it is. This has been fixed. Issue in auto task creation by parsing email using E-Mail Commands set with template name has been resolved. Issue in not being able to change/set Table Settings in the Incident View while attaching incidents to a Problem has been fixed. Requester Name not being displayed in the Edit form of Change Module [though the requester name is retained internally] has been fixed. Option to create Incident/Service Request from any workstation/asset/component has been introduced. It is available under the Actions menu of the Asset details page. Performance Enhancement: You can now Search for assets while adding or editing a change, problem or asset in the corresponding modules. This will also reduce the page loading time. 'Tomorrow' option has been added in the Date Filter list using which you can easily generate reports due for tomorrow. Provision to add 'Multi Processor Details, Multi Network Adapter Details and Multi Hard Disks Details' of a resource has been enabled. Option to specify Serial Number of the resource has been introduced. Location and Probe columns will now be available in the column chooser in Workstation list view. Technicians were able to view tasks in Task list but were unable to view the Task Details when a task was assigned to their group. This issue has been fixed. Minor errors in translation to Russian have been fixed. Html text with the hyperlink in Announcements details was previously unresponsive. This has now been fixed. Business rules can be configured based on the status of requests. Audit logs for the "delete" action in the problems and the changes modules will be recorded in the system log. New formats for setting dates are available. Departments created for referred sites will be listed in the criteria selection for both business rules and SLAs under the default site. The title panel displaying the project name, milestones, and tasks can be expanded to view the full text under the Gantt chart view in the projects module. Junk notification filter and spam filter updates will be recorded in the system log. Notifications were not sent when technicians were assigned using business rules. This issue has been fixed. Notifications were not sent when the request status was changed to "resolved/closed" using business rules. This issue has been fixed. In business rules, criteria that were separated by commas did not get applied correctly. This issue has been fixed. Pick list values set to "0" were incorrectly getting displayed as "not assigned". This issue has been fixed. The issue with setting the "cost center" value as "none" in purchase management default values is fixed. A new SMS Gateway feature to send/receive SMS, in addition to the existing Mobile Service Provider feature, has been introduced. Users can choose from two independent vendors: Clickatell and Screen Magic to avail the service. The reply message disappears when a user tries to hide an expanded message in Requests. This issue has been addressed. In Requests, the "due by date" field could not be set when updating a site with custom settings for holidays. This issue has been fixed. The owner receives the "project assigned" notification for every update on the project. This issue has been fixed. The project description field does not get displayed correctly in the notification email. This has now been fixed. The issue with viewing the change associated with an asset has been fixed. The issue with the user interface where the Project Manager role was able to select all the projects, has been fixed. The issue with editing request notes has been resolved. In Solutions, adding a new topic was not possible when there were no existing topics. This issue has been addressed. The request approval mail will now be sent with the assigned group's email address. SLA Configuration for the Due-by-time calculation and escalation(s) can be set to include or exclude organizational holidays and weekends. SLAs can be configured with the Group-based criterion. SLAs can be configured to perform action-based escalations with parameters including priority, group, level, and technician. Users will be allowed to view only those topics for which they have access permissions. The option to print the description alone in requests is available. 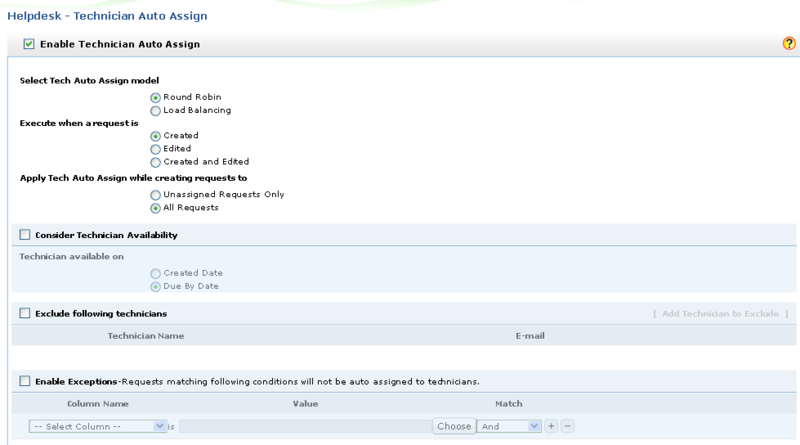 Requesters can be allowed to choose tasks while creating a request and also to view the request tasks based on configurations set in the request template. Replies from the technician or users in CC in the email sent for request creation will be automatically merged with the request as conversations. The approval status is included in the print view of requests. The issue where the asset data gets removed when the request fields are updated using the email command, is fixed. The issue where the remote control option does not appear for requesters if the logged-in technician does not have Editing Requester permission, is fixed. The notes section includes the rich text format. While creating a new problem or change from a request, the requester's name gets auto-populated. 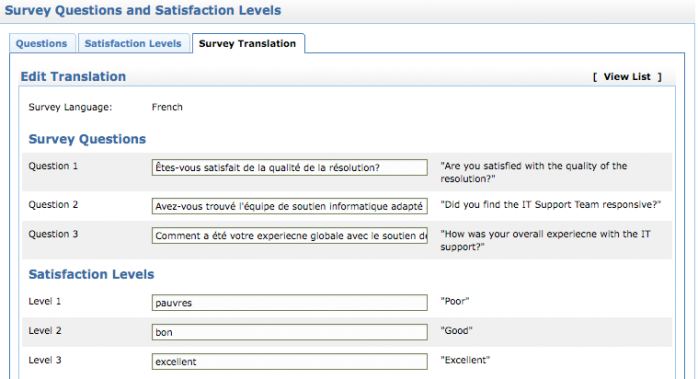 Survey emails are customizable with dynamic variables of request, similar to those in notification templates. The Import Data option under the Data Administration tab now supports files in the "xls" and "xlsx" formats also. The Export Data option under Data Administration also supports files in the "xlsx" format. Files in csv, xls, and xlsx formats can be imported. Files in csv and xlsx formats can be exported. Maintenance Cost is available as an item in the Contract list view. The login gets automatically enabled for the deleted users who are added back during the scheduled sync. Tasks can be triggered to automatically set the time of trigger as the "schedule start time" and assign the marked group/owner to the task. Import categories, subcategories and items that help categorize the incoming requests, as a CSV file. Technicians with the 'SD-Coordinator' role can view the availability of technicians and the number of open requests assigned to All Technicians across All Sites. In the Provisioning tool, the 'not disable/delete users during scheduled sync' option is available. You can now create projects, manage resources and track progress. You can integrate IT projects with requests and changes to fine-tune overall IT service delivery. Projects is available for Enterprise edition by default. For Standard & Professional editions, it is available as an add-on. Work log will now have execution start and end time. Older Work log's execution time will be moved as execution start time now. Support for canceling purchase orders. When a purchase order associated with a service request is rejected, received or cancelled, notifications are triggered to the technician associated with that service request. When requests are picked up by/assigned to multiple technicians, a conflict of technicians pop up is shown based on which further actions can be driven. There was an issue while accessing assets after deleting all the non-IT product types. It has now been fixed. Earlier while assigning a department to a requester from the list view, the list of available departments did not populate. This has now been fixed. Issue while adding payments to purchase orders has been fixed. There was an issue in sending notifications while auto assigning technician during a request edit. It has now been fixed. Error while generating reports for Workstation/Server has been fixed. 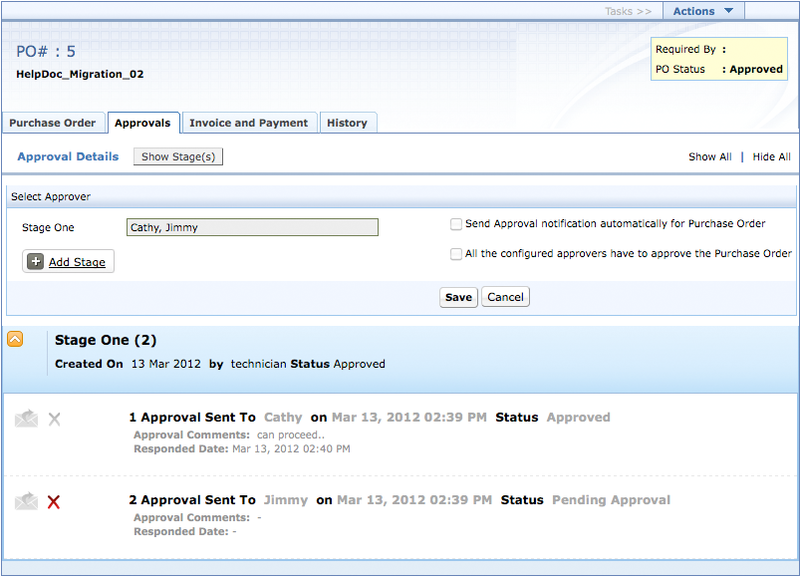 Issue fixed in displaying the approvals tab, when the approver is removed with appropriate approval permissions. Issue fixed in not prompting mandatory alert for request fields on request update when the priority field had been removed from the template. Issue in updating request OnHold status schedule has been fixed. Support for general top level domains like .digital, .fly, .football, and .gallery. Request search enhancement for quicker results. Notification technician count increased to 50. Issue while adding new additional field in template has been fixed. Issue while viewing the change details from request details has been fixed. Issue while saving business rule criteria with To/CC fields has been fixed. E-mail Commands: E-mail commands allow technicians to delimit fields in the e-mail, according to which the e-mail will be parsed and corresponding fields will be set. Multi Currency Support: ServiceDesk Plus On-Demand now supports multiple currencies for Purchase Orders (i.e asset procurement from different vendors). Choose the most frequently used currency for your organization from over a list of 162 currencies. To know more about 'Multi Currency Support' feature, visit our forum. Site variables like Site, Site Description, Site Address, Site City & Site Postal Code can now be included in the notification templates of the Request, Problem and Change modules. Technicians can change the request status when replying to a request. A request that is set to On Hold can be scheduled to change status after a specific period of time which can be configured in the portal. You can also configure the portal settings to mandate comment field entries when changing the request status to On Hold. Technicians can view the Logged-In Technicians of their associated sites. Issue while selecting the scan option for Routers/Printers from the asset list view page has been fixed. Trash in requests module: Deleting a request will now move it to the trash. The trash can be accessed from the requests filter drop down. Deleted requests will be deleted after 30 days from the trash. A technician can recover/delete requests permanently from the trash. A problem can now be marked as Known Error manually. Previously, it was automatically set to true on adding a solution or workaround. Any change type can now be set as pre-approved. Earlier, only changes of type 'Standard' were automatically considered to be pre-approved. If the user has set a department manually and an empty department value is encountered during provisioning sync, the server will not overwrite the value. The envelope icon in the Requests list view page will be set to green colour on a technician's reply and not when automated system notifications are triggered. Provisioning tool can now auto update itself. Replace your old provisioning tool with this new tool to automatically avail future updates. Remote control is now available in the request page. You can initiate a remote control session with a requester through email or can directly take control of the requester's asset. To directly take control of the requester's asset, remote control add-on must be purchased. Service requests and purchase orders can be associated with each other. If a technician replies to a request from his email notification and includes the requester's email id in the to/cc list, the reply will be treated as a response to the request. If it is a first response, then the first response time will be updated. A notification option has been added to notify the requester when his request is assigned to a technician. Reminder emails for requests, problems, and changes will now include the corresponding entity links. Purchase order number field now supports alphanumeric characters. A new option has been introduced to disable new requests from being created through emails, thereby requester would not be able to create new requests by sending emails, but existing requests will be appended properly for email replies as conversations. Administrator can allow or restrict technicians to edit/delete notes by assigning a new restriction permission "edit/delete own notes" in the roles section. Administrator can allow or restrict technicians to edit closed tickets by assigning a new restriction permission "editing closed requests" in the roles section. Previously, when users logged in to their self service portal, frequently used solutions and service templates for which they did not have access were restricted through an alert. Now, these solutions and service templates have been prevented from being listed. Import data from Google Apps option is now available for the Trial edition. An error occurred when trying to download duplicate attachments containing underscore special character in thier file name. When 'Alert(or Notify) Technician by Email when there is a new reply from the requester' notification is enabled and when the technician is notified, requester description will be appended to the notification. When editing an existing contract that had user additional fields added after creating it, an error occurred. Option to add multiple approvers across different stages and save configuration. Option to separately send out approvals to configured individual recipients along with a customizable subject line and description. While in the details tab of request details view, the description of the ticket was not completely loaded. Technicians were assigned requests via technician auto assign feature even though they were on holidays belonging to another time zone. While in data archive feature, when site based criteria are included as exception rules and saved, the exceptions were not visible. When replying to requests via iPhone, the application crashed. All system folders were listed in the reports list view irrespective of the subscribed edition. For example, system folders pertaining to the problem and change modules were listed even though the user was listed as a standard edition user. Purchase order additional fields that were earlier displayed in the quick view pane of purchase order details view have now been moved under the general information section of purchase order tab. The length of Base DN field present in the add/edit windows domain pop up has been increased to 250 characters. When logging into the application in compatibility mode using Internet Explorer browser, the company logo partially disappeared. On the conversations tab, click on the attachment icon present in the subject line of any conversation and it will directly take you to that respective attachment. On the quick view pane of the request details page, when you associate a request, problem or change to an existing request, you will now see an new pop out icon. Clicking on this icon will lead you to the request, problem or the change that you wish to link to the existing request. Inconsistent organization logo size in the login page. The new user interface has been rolled out and it comes with several new features, enhancements, and bug fixes. Below is a list of bug fixes and features that have been added. When converting an incident to a problem or a change, the site information in the incident is automatically applied. This helps you to filter problems and changes by site. You can also ensure that technicians view only those problems and changes in their associated sites by defining appropriate permissions in Roles. If no site is mapped to a problem or change it will be marked as being in S� Not in any Site? How does this new enhancement impact existing problems and changes? All existing problems and changes will now have the Site assigned to 'Not in any site'. If a technician is unable to view an existing problem or change ( that he was able to see earlier ), you need to map him to S� Not in any Site? The Live Chat Add On is priced at $6 per technician per month available across editions and all customers are offered a free 30 day trial. To activate your Live Chat trial, go to Admin and under ‘ General’, click on ‘ Chat Settings’304 and click ‘ Try Now’. For any help, you can refer to detailed documentation available here. We rolled out a release yesterday where we have made the Authentication check for Outgoing mails to be mandatory. The existing setup would continue to work for all the customers without any issues and this change will take into effect only when you try to edit and save the mail server settings. We have added a new column called ‘ Id’ in the Survey Results list view and ‘ Request ID’ in Survey Reports for easier identification of requests. Empty error pop up appears when using the Request Refresh option with multiple tabs in Internet Explorer. Error while viewing Request details when clicking the Request Title column in the Survey Report. Subject appears truncated in certain requests when archived requests are exported in XLS. Error while trying to edit technician profiles in certain accounts. You can now define Worklog permissions ( View, Add, Edit 304and Delete) on the304 Request, Problem and Change module while defining Roles for technicians. All Worklog permissions are enabled by default for the SDAdmin, SDChangeManager, SDCo-ordinator304 and SDSiteAdmin roles. You will have to explicitly enable worklog permissions for other custom roles that you define. You can also decide if technicians can add 304Worklogs 304for closed tickets by going to the Self Service Portal settings in the Admin and selecting the appropriate option under ‘Do you want to prevent add worklog for closed Requests/Problems/Changes ? SDAdmin, SDChangeManager, SDCo-ordinator304 and SDSiteAdmin roles will have all Worklog permissions enabled. Custom Roles which have Edit permissions enabled for Request module will have all Worklog permissions ( View, Add, Edit 304and Delete) 304enabled. Issue while trying to save a contract when the name exceeds 100 characters. Descriptions in Task notification emails appeared in a single line without break. Links in notifications configured in the Reply and Task templates were not accessible. The Text field for answers in the Service Catalog Resources section is enhanced to a Text Area to support more characters. The ‘Reply from Requester’ notification to technicians did not work when the end user replied from the Self Service Portal. Report information in scheduled reports did not update correctly after edit. Multiple tasks in Service Request Template were assigned to the same technician even when this was not configured in the template. To activate your free 30 day trial of the Custom Applications platform, go to Admin and under ‘ General’, click on ‘Custom Apps’.To get started with creating your first custom app, visit the help documentation here. Probe scan will no longer consider the DNS name. Notes added will be considered for first response for requests. This configuration is available in the Self Service Portal Settings. API is now available for Linking Requests, Adding Notes for First Response and Adding Notes to the child request from the parent request. In the Mobile browser, the requester was able to see the private notes too. In the Tech Auto Assign, issues in assigning technicians in load balancing model as all statuses instead of pending status were considered. Incorrect updating of departments in assets when a site is deleted and the requester/asset is associated to other sites. You can now link requests and create Parent - Child relationships between them. Not only can you link requests to one another but you can also perform certain common operations such as adding notes and creating resolutions across linked requests. You can find more details in our help documentation here. Unable to split a merged request when the parent request has a technician assigned for the category. Technicians can now be converted to Requesters: In the Technician List View, select the technician you want to convert as Requester. Click Actions and select S� Change as Requester?. When an approver was deleted from the CAB in a change, the request for change approval was still shown in the Home tab of the Self Service Portal. Months in Matrix Reports were repeated. Incorrect Date format in Date columns for advance filtering under Reports in IE 10. Email IDs with apostrophes not allowed while sending/forwarding notifications. CAL users list was not alphabetically sorted. Asset history did not capture User's site information while updating the asset state. Issue while saving group unpicked notification checkbox. Thread availability issue in Probe, because of which ADLogonApp fails to download scan script and push result. Last logged in user details during Asset scan was not updated. Deleted users were not removed from the CAL user list. License key was not shown in the Software License details while associating a license to a workstation. Months in Matrix reports were not displayed in order. Report title did not appear in the S�Advanced? tab of Matrix reports. Assets of Type Sever will have the Product Name as Model similar to Workstation while adding/editing a server. New request is created, request is assigned, requester has replied, request is re-opened, request is closed, request added to Group, request left unpicked in Group. Notification text will be the same as "Subject" configured for corresponding notifications. A maximum of 25 messages will be shown to the user. Push Notification will not be sent to the logged-in user who performs operations like assign / close / etc. Non login users were not able to close their resolved tickets. As a step further in helping you to ease the customization of ServiceDesk Plus On-Demand for your organization we have now provided the capability to specify your organization logo in one single place and include that in the invitation emails sent out to users. Going forward, you will be able to upload/change custom images (logos, etc.) only in the’ Organization Details’ section under Admin. This image will be used in the Portal, Headers, Purchase Orders, Reports and the Invitation emails. Please note that only the Organization Admin(who has User Management permission) can upload/change custom images in the application. If you have your own custom image uploaded in the Organization Details already and have checked the ‘Show & Use this Image’ box already, this image will be uploaded under the Custom Image and used as the organization logo. If you have uploaded any custom image in the Self Service Portal Settings, that will be ignored. If you have your own custom image uploaded in the Self Service Portal Settings already and have the ‘Use Custom Image’ option selected, the custom image will be used as the organization logo. This is in cases where you have not uploaded any custom image in the Organization Details or have uploaded a custom image but not checked the ‘Show & Use this Image’ box. The questions and resources in Service Templates will now be in the order as added by the user( technician) . Previously resources were added in alphabetical order. 1. Service Request Approval Status Tab for Requesters : You can now let your requesters view the approval status of their Service Requests at each stage. This configuration is specific to each Service Request Template. If you would like the requesters to be able to view the approval status for a particular type of Service Request, edit that Service Request Template and in the Workflows tab, enable the 'Show approval to requester' checkbox. 3. Turkish Language Support: ServiceDesk Plus On-Demand is now available in the Turkish Language version. You can now include specific people to be copied for auto communication on creation/resolution/closure for an incident or service request. All you need to do is go to the respective incident/service request template and drag/drop the 'E-Mail Id(s) to Notify' field on the left hand side onto the template. You should also enable and configure "E-mail Cc users" notifications under Notification Rules. Please refer to detailed documentation for Incident Templates and Service Request Templates. Lease Start and Lease Expiry fields have been included in Reports. It is now possible to set default passwords in the Provisioning App during user import when SAML authentication is not used. Technician conversations in requests can now be forwarded. Organize Tasks' in Incident Template would show only 25 tasks. Selecting multiple tasks to organize threw Input Length errors. Location field in Assets was set to empty when the Resource state was changed to 'In Use. Request History view in Requester logins showed all information including technician notes. This is now restricted to show only Status Change, Merge and Split. Technician List did now show in the Standard Edition. During request edit, the technician names were repeated in Technician List when there was no Site or Group in the Request. Submitting the change approval through the mail link threw permission error. In the absence of Group and Site in the Request Template,updating ticket details marked the ticket ' Unassigned'. AD synchronization caused approval permission being over written in user profiles. We have now released the Service Catalog feature in ServiceDesk Plus On-Demand. With the Service Catalog in ServiceDesk Plus On-Demand you can now document and publish the range of services offered by the IT ServiceDesk to the end users in the organization. You can get an overview of the Service Catalog here .You can get started with configuring the Service Catalog for your organization here and define Service Catagories, SLA and Service Items in your Service Catalog. Note : For existing customers, please note that your Default Request Template will now be listed as 'New Incident' template in the application under the ' Request Catalog' button. Also this feature is available only in the Enterprise Edition of the application. Requests Auto Refresh : We have also rolled out the Auto Refresh Feature in ServiceDesk Plus On-Demand. You can now choose the Refresh Frequency in the Requests List View Page to be 3, 5, 10 or 30 minutes. Reports: You can now pull reports on Requests based on the Assigned Time and Approval Status. New look and feel for the Requests List View in the Android App. Add/Edit worklog in the Android App now includes incident cost, total charges based on Cost per hour calculations. IE10 Windows Scan( using Activex) threw errors. Android App crashes while changing Site and Category. Google Apps and SAML login issues in the Android App. With the new app, your technicians can access your IT ServiceDesk on the go using their Android Mobile Phones helping them create, update and resolve tickets anytime from anywhere. Not only that, technicians can also mark time spent entries on tickets, add notes, reply to end users from within tickets and view tickets on pre-defined filters. We believe that the Android App for ServiceDesk Plus On-Demand would help you respond to and resolve tickets faster increasing IT helpdesk efficiency and improving end user satisfaction. Filter requests based on criteria such as unassigned, pending, open etc. Changes to the schedule in Preventive maintenance tasks did not get updated. This was fixed. Caching issue while adding new templates was fixed. ServiceDesk Plus On-Demand introduces Remote Control Add-on feature for screen sharing between technicians and end users in different locations with Zoho Assist. The feature is agentless, so there is no need to deploy and run agents in each system. Supported operating systems include Windows, Linux and Mac. For more details click here. Enable/Disable Logins for Users(both requesters & technicians). User Management using Provisioning App. Note : In case you are using the application already, please note that the Super Admin ( the email address with which you signed up for the current subscription) will now be an Organization Admin. Login screen in spanish and Japanese language had some special characters. Occasionally, the system user getting updated with any other existing organization user during delete and syncing users using Provisioning App. The Change Approval action taken mail had the incorrect technician name. Special characters in email subjects were incorrectly displayed. $Request link in the notification email referred to an incorrect URL. There were issues with scanning Assets having the same Service Tag. Complete threaded conversation did not appear in the Reply template while using the $Description variable. In Group Add/Edit - Adding technicians in the group notification email list caused alignment issues. Error while adding Pick List items[for additional fields] due to restricted character count . We have changed the way you can add new additional fields in ServiceDesk Plus On-Demand. From a tab based view provided earlier, we have moved to a list based view for easy creation and management of additional fields. You can refer to the Request Additional Fields help document here to see how you can create, view, edit and delete additional fields in the application. You could choose up to 10 tasks to be executed when a request is raised. We have now increased this limit to 50. When a request previously assigned to and viewed by a technician was changed to ‘Unassigned’ by modifying the site or group, the request subject did not appear in bold in the Request List View. Change approver when clicking on the email link to approve the change was unable to view attached documents in the change as the link was missing. The first 500 characters in the content of the Subject in each solution will now be shown on the tool tip. Auto Close option did not work for requests in the ‘Resolved’ status created through Preventive Maintenance Tasks. We have provided new APIs for the bulk operations on requests: Pickup, Assign, Merge, Close and Delete. You can detailed information here. Tickets that were in the ‘On Hold ‘status were flagged for SLA violation. This is now fixed. Asset Scan using the Probe is now enhanced to support the following types of printers: Kyocera, Samsung, Lexmark, Emulex, NRG, Konica Minolta, HBM Lan. During User Import in the Provisioning App, the total count of users imported will be displayed in the LDAP Query Results Page. Reports in ServiceDesk Plus On-Demand now support 3 new types of charts: Time Series Chart, Line Chart and Area Chart. SLA escalations now take business hours into consideration. During User Import/Sync using the Provisioning App, user list was not sorted. In the IPhone App, when the ‘Item’ field is not part of the request, that request could not be opened. Due by Time calculation was wrong when the request was resolved or closed. Report output did not match the configured ‘Date Filter’ criteria in Reports. OEM (Original Equipment Manufacturers): License type for software that is already installed in the hardware. Named User License: License Type for a specific user. Volume: License Type supporting multiple users. Client Access License (CAL): License type that gives a user the rights to access the services of the server. Trial License: License Type for trial versions of software. Enterprise (Perpetual): License Type that does not require renewal and is for life long. Concurrent License: License Type for software that can be accessed by a specific number of users at a time. Free License: License Type for freeware software. Enterprise Subscription: License Type that requires renewal for every specific period. Node Locked: License Type for workstations with specific configurations. You can find more details of adding a license here. You can create software license agreements and associate them to software licenses. You can attach softcopies of the agreement and add Purchase and Invoice details. You can set the Agreement Expiry Notification to go out to selected users a specified number of days before the agreement expiry. Like software licenses, you can edit and delete software license agreements and print them out too. When a request is marked ‘Resolved ‘, Notification mail was not sent. ‘Cost Center’ edit was not getting saved in Purchase Order. Incorrect Description updates occurred in Request history. User in SAML enabled logins could not access links in notification emails. Report Description field, previously limited to 100 characters has now been increased to 5000 characters. Notification email was not sent for ticket assignment when Technician Auto Assign is enabled. While importing requesters by CSV, same Sites in different alphabet case threw errors. CC fields in Requests were auto filled with the text ‘not provided’. We have rolled out a new version of the Provisioning App that offers a better way of importing Requesters in ServiceDek Plus on-Demand from your Active Directory/LDAP. Not only that, with the Provisioning App, you can automatically synchronize SeriviceDesk Plus On-Demand with your Active Directory by running the Provisioning App as a Scheduled Task in Windows to automatically add, update, disable or delete users from ServiceDesk Plus on-Demand on a periodic basis. You can find more details of the Provisioning App here. For details on configuring AD SSO for your ServiceDesk Plus On-Demand instance please see here. While trying to delete a Site in the application, an alert is shown to the technician asking if existing Requesters, Probe, Assets, Request Template and Preventive Maintenance tasks associated to that Site need to be associated to another site. You can also choose to not select any site and move the existing Site associations to ‘Not associate to any Site’. Welcome Screen in French - The text in the Welcome Screen in the Customized login page was displayed in English even after the French language selection in the browser was enabled. This is now fixed to correctly display French. Issues while creating tickets in Groups – When two alias accounts were configured on the system to route incoming tickets to two different groups, only one ticket was created instead of two. This is now fixed. Work log description - In the Request Details Page, the Worklog list view did not display the complete description. This is now fixed to show the entire description. Request Template Issue: When a new request template was created, a newline character was inserted in the Resolution by default. This is now fixed and the character removed. Preventive Maintenance Schedule – Schedules were not getting saved correctly in the Preventive Maintenance tasks. This is now fixed. Script Error in Italian version: There was a script error thrown while trying to modify a Requester into a Technician. This is now fixed. Time Spent Report Issue: There were discrepancies in calculating the time spent on tickets. This is now fixed. We released a hotfix today that has made ServiceDesk Plus On-Demand browser compatible with Firefox 11. Technicians can now choose to notify Approval senders( technicians) of Approval action ( approved or rejected) in the Requests module. Issues in saving the Requester Canvas in the Request Template have been fixed. We have rolled out some enhancements to the Purchase Order ( PO) module in ServiceDesk Plus On-Demand. A new PO approval mechanism: The existing PO approval mechanism in ServiceDesk Plus On-Demand stands changed. The single level approval system is replaced by what is called a ‘multistage, multiple approver’ PO approval mechanism. 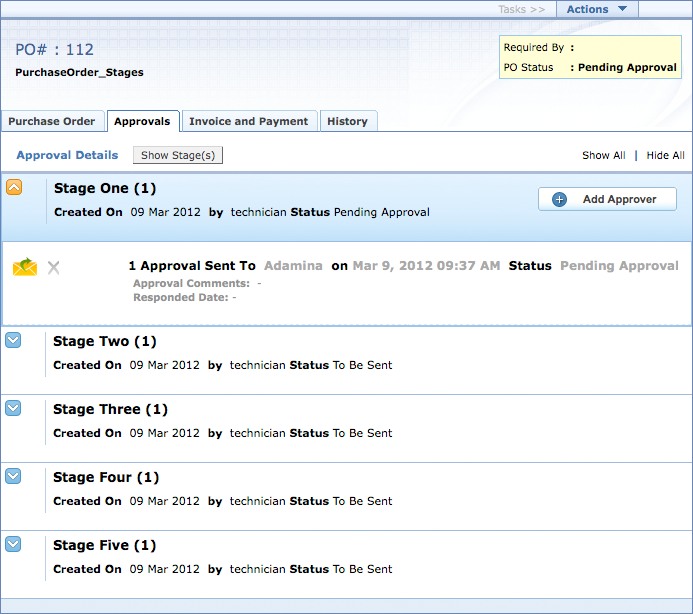 You can create up to 5 stages of approvals with multiple approvers (requesters or technicians) in each stage. Please click here to find more details of the changed approval mechanism. 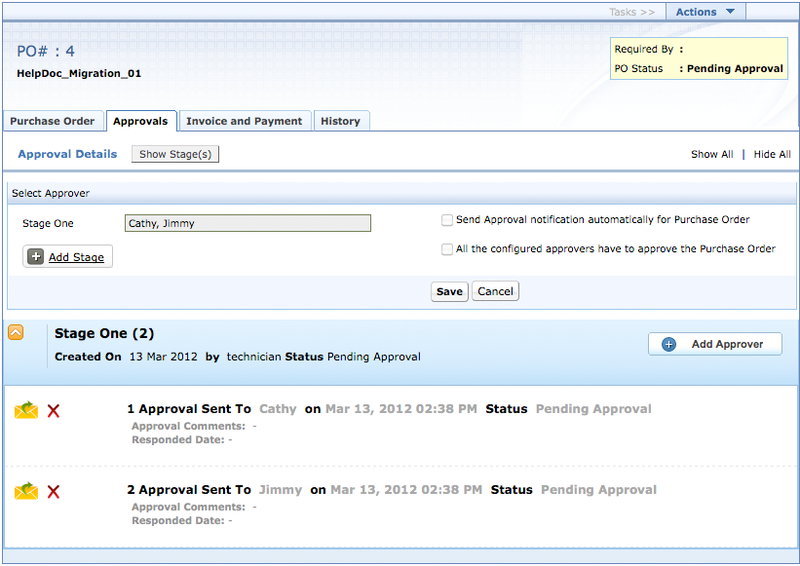 Configure email templates for purchase order approval notifications. In case Cathy has approved the PO while Jimmy's decision is pending, the status of the PO is ' Approved' since one of them has approved the PO. In case Cathy has rejected the PO while Jimmy's decision is pending, the status of the PO is ' Pending Approval' since only one of them has rejected the PO. The final status of the PO depends on Jimmy's decision to approve or reject it. In the list view, select any template and click on the ‘Make Default’ button. The template selected will now become the Default Template. In the screen shown, ‘My Template’ a Request Template has been made the default template and hence is indicated by a small icon. Reopening a resolved request by email caused incorrect due dates to be set. This is now fixed. The ServiceDesk Plus On-Demand API allows for the integration of ServiceDesk Plus On-Demand with applications for network monitoring, intranet web applications and other third party SaaS applications. The API currently provides integration points to various help desk modules including Requests, Incidents, Users, Notes, Worklogs and a host of other Administrator functions like Site, Category, Status, Level, Priority, Mode, Impact, Urgency, Request Type and Request Templates. The ServiceDesk Plus On-Demand API supports XML and JSON formats and is programming language-neutral allowing developers to create applications in a language they are familiar with. Two fields 'Other Charges' and 'Total Charges' have been introduced. The 'Total Charges' would be calculated by summing the Technician Charges and Other Charges. The 'Time Elapsed' section in the 'View Request' now includes the Tech Charges, Other Charges and Total Charges in display. We have just rolled out an improved and better Flash based dashboard for ServiceDesk Plus On-Demand. Open and OnHold Request Views in filter will now also include Custom Statuses created in the application. You can now open actual Incident details from associated Incidents section in Change and Problem details. Earlier the Incident details were loaded at the bottom section. An additional column is now added which would open actual Incident details page. You can now view the list of technicians who are configured for a given role. This is available in Admin » Roles section. Azerbaijan is included in the options to select the country name while creating a site. 1) Asset Additional fields imported through CSV would not be updated correctly. This is now fixed. 2) Issues (Server Errors) in opening attachments in the mail sent for request approval is fixed. 3) Unread requests were not highlighted in bold in the Request List View. This is fixed. 4) Domain text field under Self-Service Portal Settings could not be edited and this is now fixed. 5) Site field did not appear in the Request view column chooser for the Standard and Professional editions. This is fixed. 6) Issue in displaying technician leave details for users in other timezones fixed. End to end incident management operations such as Creating Requests, Editing Requests, Picking Up Requests, Assigning Requests, Closing Requests and Deleting Requests. Detailed Request List Views with flags for Overdue ticket status, first response SLA violation and new email reply received from user. ServiceDesk Plus On-Demand is now available in 12 different languages: French, German, Spanish, Russian, Dutch, Norwegian, Portuguese, Swedish, Italian, Polish, Chinese and Taiwan Chinese. You can choose your language when you first log into the service or change it midway at the click of a button. The probe for asset discovery so far could scan workstations across Windows, Linux and Solaris environments. The probe now has capability to automatically discover assets like printers, routers, switches, etc. using SNMP. If you do not want to scan the entire domain and instead want to scan only an OU, you can provide a base DN in the Domain Scan page. With the First Response SLA feature, you can now specify the time within which a request needs to be responded to, in terms of days, hours and minutes. You can also escalate the ticket to other technicians and/or the owner if the ticket has not been responded to within the specified time limit. You can also pull reports based on First Response SLA. The System Log is can now be exported to an XLS or CSV file. You can now customize the calendar view in the Self Service Portal Settings by selecting the start day of the week from a drop-down. The selected day will be considered the starting day of the week in all the calendar views. Reopen the same request within a specified number of days from closed time. Else, create as a new request. Append the reply as conversation to the request and notify technician. Create as a new request. It is now possible to configure the system to stop the timer for those tickets that are awaiting approval. If stop timer is enabled, timer will be automatically stopped for requests. You can also configure the status that must be set while the request ticket awaits approval. You can now add and execute Business Rules and Service Level Agreements without selecting the criteria. These Business Rules and Service Level Agreement are executed when none of the request values satisfy any parameter criteria mentioned in other Business Rules and Service Level Agreement. For reopened requests, the time frame in which the ticket moved from the ‘Closed’ to the ‘Open’ state is now added to the ‘Due by’ time of the request. Information on the request site can now be viewed from the request details page without any configuration by just clicking on an icon next to the site name. 1) Individual technicians could not customize the Request List View Columns according to their preference. This is now possible. 2) In the reports module, the input length of filter criteria was restricted to 100 characters and threw an error if it went over this limit. This restricted is now removed. 3) The Audit Trial of assets showed the time in server settings and not the user specific time. This has now been fixed to reflect the time zone of the user. 4) Laptops scanned by the probe were wrongly categorized as desktops in the application. This is now fixed. 5) The custom domain name did not allow for the use of the special character “-“.The use of this special character in the custom domain name is now permitted. 6) In the Requests module, the time spent value was shown as the difference between the completed and created time. In the TimeSpent module, the time spent field showed the time entered in the work log and the elapsed time field showed the time spent (difference between the completed and created time).This is now fixed in such a way that TimeSpent field shows the difference between the completed and created time in both modules and the time elapsed field shows the value entered in the work log. 7) Asset import from CSV with cell data containing multiple lines threw errors. There were also errors thrown while attempting to import assets with additional field details in the CSV file. This is now fixed. You can now integrate ServiceDesk Plus On-Demand with your Active Directory for importing user information. Users will be able to login to ServiceDesk Plus On-Demand using their Active Directory credentials. In addition, they can also leverage the advantages of the single sign on capability provided by Windows Integrated Authentication. This capability is highly secure and standards based, and is implemented using SAML for all user management assertions. For more details on how this works, refer to this document. One of the crucial requirements in rendering IT services is to offer certain services globally to all users and restrict certain other services to specific users alone. To achieve this, provision to create 'User Groups' has been introduced. You can classify the ServiceDesk Plus On-Demand users within your organization into various User Groups. After creating the groups, you can carry out various 'group-based' services - for example, announcing service downtime to the user group belonging to a specific location. In typical help desk environments, there would be requirements to assign the same or similar tasks to different users at different times. Adding the tasks afresh every time leads to waste of time and resources. To overcome this, 'Task Templates' are provided. Templates can be created with details about the task and they could be assigned to users instantly without having to fill the details. Task Templates can be used for adding tasks on a request, problem or change. In day-to-day customer support, quite often the technicians will receive requests that involve the same or similar solution. In such cases, instead of typing the solution repeatedly, 'Resolution Templates' could be created. The template will contain the solution, which can be sent to the customers instantly. 1) When selecting specific columns among the additional fields in the column chooser for display in 'Request List View', earlier, only 20 additional fields were listed. Now, it has been enhanced to include all the additional fields. Earlier, this was available to Technicians. This has now been extended to Requesters also. 2) The 'Print View' of problems, changes and requests now provides the option to select only specific items for printing. For example, when printing a change, you can just print the Work Log and History alone. 3) Earlier, the 'Work Log' in 'Problem' and 'Change' displayed only the recent 10 records. This has now been changed to include all the available records. 1) Earlier, when Problems and Changes reports were edited, some column names were displayed as 'Null'. This has been fixed. 2) Timezone and time format display has been standardized in the application. The organization timezone will take effect everywhere. 3) Requesters are identified through their email addresses. A new email address is treated as a new user. Case-sensitiveness was imposed in parsing the emails. The same email address with different case was considered as a different user. This has now been fixed. The email address is now considered case insensitive. 4) In Asset Management, when the Acquisition date of Software License was edited , garbled characters were displayed. This is now fixed. New request filters have been added to enable viewing the requests approved / rejected by users. Requester list view under "Admin" has been changed with enhanced search options. 'Requesters' can now be searched based on email, phone and mobile numbers. Requester additional fields can now be viewed in the "Request Details" page. 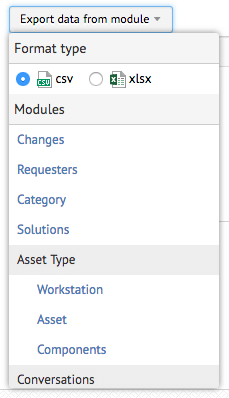 Asset additional fields and workstation additional fields can now be viewed on "Associated Asset List" view in the "Request Details" page. Home page now depicts list of 'Requests', 'Change' and 'Purchase' waiting for user approval. Issues in depicting the reports "Completed Problems by Cost" and "Completed Changes by Cost" have been fixed. Earlier, it was not possible to remove default fields such as 'Level', 'Request Type' and others in "Request Template". This has been fixed. Problems in showing time / datestamp based on timezone have been fixed. When a technician attempted to reply to a request created by him, a script error was thrown. This has been fixed. Issues in importing non-IT assets have been fixed. Earlier, when site creation was done by importing requesters, default settings were copied. This has now been changed to refer to the default settings. In the technician/requester email address, usage of hyphen is now allowed. When the site column had been left empty, asset import through CSV did not work. This has been fixed. Earlier, there were issues in automatically converting emails into tickets due to case sensitive nature of requester/sender email address. This has now been fixed. Issues in importing requesters through CSV have been fixed. ServiceDesk Plus On-Demand Probe now scans for Mac, Solaris and IBM AIX workstations. This is in addition to the Windows and Linux that are currently supported. Software inventory scanning for Linux, Mac, Solaris and IBM AIX is also now supported. Don't let your tickets stay in the queue, unassigned anymore. With the new Auto assign functionality you can automatically distribute the tickets to your technician based on their availability and criticality of the incident. ServiceDesk Plus On-Demand has introduced Round Robin and Load balancing methods which will address different helpdesk environments. This auto assign functionality from ServiceDesk Plus On-Demand can now do the job of your helpdesk coordinator automatically. While replying to requests, technicians tend to type the same response repeatedly to quite a few requests of the same type. With Reply Template, Admin can create templates that can be used by technicians to send responses thus saving time and effort. Admin can create each template with a unique name with configurable subject and content. The templates are displayed as a list for technicians to choose in the 'Reply' page.